Its roads, then, are its arteries, veins and capillaries, keeping the whole system alive. Here, today, in Nairobi, they have became so clogged that we are slipping into coma. This is a city laid out by those who never imagined such a swiftly expanding population, nor that a third of them would today own cars. A city with a center, at its center, and just four major road arteries spiking out from each corner, connected by a latticework of capillary lanes, today all as jammed as the next. A city whose leaders long ignored the fact that they were responsible for fixing the mess in which they sat stuck, in their smart 4x4s, alongside their hapless constituents, together crawling along at an average 16mph. It’s another of those endless dinner party conversations. “The traffic, isn’t it awful”, “I can’t see how it can ever be fixed”, “too many cars”, “awful public transport”. Commuters – at least the 53% who don’t walk – setting their alarm clocks ever earlier, in the ever-vain attempt to beat the jams. But join one of those spikes heading out from the center, the one going north, and today you’ll soon see things are changing. For one, the road, as it was, is no more. It’s been smashed up and shoveled out, leaving a deep gash heading away from town where your GPS tells you the asphalt should be. Down in that trench, as wide as a four-lane expressway (for that is what it will become), men in hardhats worked, marking measured intervals in white powder, clunking gears on clanking diggers, growling past in trucks laden with ancient earth. This is the Thika Road, an artery undergoing unclogging. 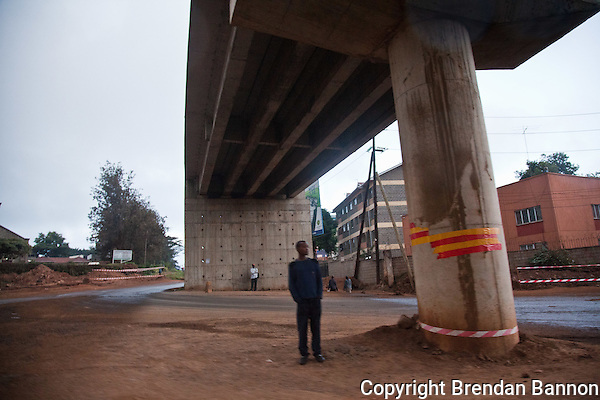 Kenya’s government in 2008 signed a $200 million contract with two Chinese companies completely to redraw this 16 mile main route north out of Nairobi. In Western cities, established infrastructure is often immutable. Systems to ease gridlock – variable speed limits, traffic lights, HOV lanes – must retroactively be fitted into what’s already there. Here, the map was virtually ripped up and redrawn. Late today, Duke Awori watched from on high as the jams stalled traffic dreaming of a speedy getaway for the holiday weekend. 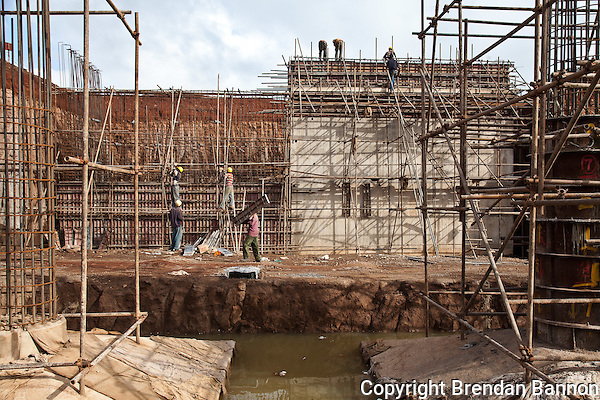 He’s a day laborer, one of the thousand or more Kenyans hired (for $3 a day, seven days a week, no contract, no insurance) by the China Wu Yi Company and the Sinohydro Corporation. 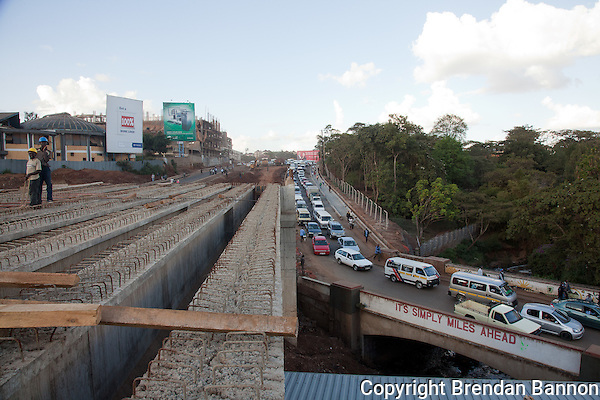 Awori’s working on the very first mile of the Thika Road, helping carve a new flyover which will accelerate drivers away from the city center, up past Museum Hill, and out towards the north. His job, he tells me, is good for Nairobi, good for his country. If only it were a bit better for his wallet, he’d be a very happy man. Earlier in the day, I met John Kaguta, a driver for a big city banker, as he sheltered from the rain beneath a new China Wu Yi bridge on his walk to work. His morning drive taking his boss to the office would be cut in half, he said, from 45 minutes to 25. These jams – pointing to the snarl around us – will soon disappear, he asserted. This is not the only major route being upgraded. Another road out past the airport is being widened and re-paved. Others on the opposite side of the city have been smartened up, as have even minor roads in that latticework of lanes. But is it too much to hope that doubling the capacity of a road will in fact help at all, when the number of private cars is also forecast to double by 2025, according to senior economists at the Ministry of Nairobi Metropolitan Development here? There is the argument that ever-more business will be conducted online, along virtual superhighways where binary digits are our transport. But Kenya’s economy is still far from virtual – it relies, and will rely for a long time, on stuff being loaded into trucks and driven from producer to customer. So, the road revamp is needed, no-one disputes that. But perhaps even more important is the installation of a light-rail system, a passenger tram, to ease the strain of one-person-per-car commuter congestion. Such schemes are planned, I’m told. But none are thus far written down on paper, with a pen held by a Chinese contractor, or any other, hovering purposefully above the dotted line. The radical surgery Nairobi’s undergoing today, which its traffic surgeons prognosticate will clear the clogs jamming our arteries, could prove to be but one stage in the treatment we need to keep moving well into a new age. This entry was posted on Thursday, April 21st, 2011 at 4:41 pm. It is filed under Features, Moving. You can follow any responses to this entry through the RSS 2.0 feed. In response to this story, there are a few thoughts that come to mind. The first of which being the modern sense of travel coming from Nairobi. The second being the sense that many Americans can relate to this topic. The idea of traffic jams and modern roadways is always a constant worry here in America. Cars are always piled up one way or another. The idea that in Nairobi, traffic can be stalled for up to 45 minutes is crazy! It puts in to perspective that being held up in traffic, poor road conditions, increased fuel prices, and car trouble is not just an American thing. It is a global issue as well. Hopefully, the ways of doing business in Kenya can change. I’m not saying that there is anything wrong with old fashion truck deliveries. If their economy can find a way to sustain the need for online shopping, maybe some issues of road travels can decrease. The goal after all ideally is to increase the economy production, at the lowest cost of the consumer. I see using alternative ways of travel and business as a huge way to decrease these traffic problems that are in Nairobi. Hopefully a solution can come soon enough so the pressure of these travelers will end! Bannon’s photos and Mike’s well-written story were intriguing to look at, especially since I am a journalism major/photo minor. They captured my attention with unique photography and compelling use of words. I look forward to seeing more work from them. True reflection of the various dimesions our beloved country.. Kenya. Kudos to you Bannon & Mike for a work well done!